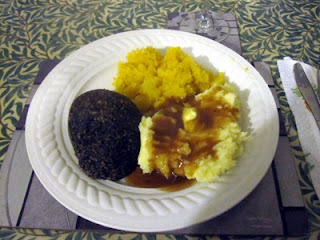 I had my Burns Night dinner last night: swede (that's rutabaga to you on the other side of the pond) mashed with butter and pepper, mashed potatoes with gravy, and oven-cooked haggis. I like my haggis cooked rather than the more tradition method of boiling because baking it produces a nice, crispy exterior. It also precludes the mess that a burst haggis occasions. My Burns Night celebratory meal occurred on Saturday because on Wednesday, the real Burns Night, I was busy picking up donuts for my obligatory birthday treats so I could bring them to work on Thursday. 1. It is mandatory. Over here, instead of your co-workers taking you out for a birthday drink, you are required (by Parliamentary decree, they tell me) to supply cakes, cookies and other assorted goodies for everyone in your office. A strange custom, but who am I to argue with tradition? 2. Bringing them in on my actual birthday was out of the question because there are so many people with birthdays in early January that we have to stagger the dates. It's an unfortunate coincidence that, in a work force as small as ours, so many people have birthdays in the first half of January. It would be bad enough if this surfeit of birthdays happened in, say, August, but the opening weeks of the year are the absolute worst time for this to happen. During December, every other day someone brings in a tin of chocolates or mince pies, and then after Christmas, the excess everyone is trying to get rid of ends up on various unoccupied desktops. And we just about get through all of that before the birthday glut arrives, playing havoc with people foolish enough to have made resolutions concerning their weight or unhealthy diets. It has gotten so bad that we are actually proposing to ask management to screen future employees and only offer positions to those who were born between May and September. But this is the situation I am stuck with, so Burns Night found me checking Google for the location of the nearest Krispy Kreme Donut distributor. I've written about Krispy Kreme before, about my love-hate relationship with them while I lived in the States, and how I was relived to put them behind me when I moved over here, and how horrified I was to find out they had followed me over. I managed to make peace with the presence of Krispy Kreme; I found they are a bit like the Killer Bees—as long as you leave them alone, they won't harm you. I even brought them in to the office as my birthday treat on occasion, making fellow Kreme-addicts out of a number of my colleagues. And so, this year, I decided to bring some in again, as a special treat (and so I could get a much-needed fix). The closest store the last time I had bought some was twenty miles away, but I thought I'd have a look to see if any had opened nearer. One had. And it was within walking distance. This is a bad turn of events, indeed. Not only is this outlet within walking distance, it is in the massive, 24-hour Tesco just across the roundabout in Broadbridge Heath. So now I have to adjust myself to the fact that, any day of the week, any time of day or night, I am a twenty minute walk—or 3 minute drive—away from Krispy Kreme Donuts. I'm not sure if my willpower can take the strain. The first step, they tell me, is admitting you have a problem. 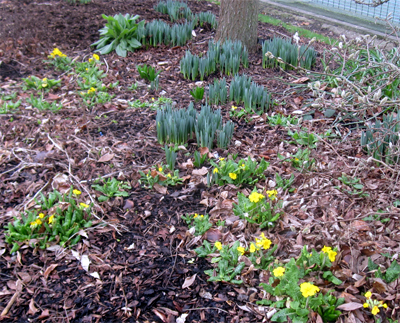 This photo has nothing to do with the post, but I wantedyou to see it to let you know that while you are still in thethroes of winter, spring is already arriving here.Jealous? It was not looking good for my Tin Jubilee. My dream had been to see all three of my books out on the first of March 2012, to mark my 10th anniversary of arriving in the UK to stay. To that end, I finished the manuscript for the final book in the Postcards Trilogy, Postcards From Ireland and sent it off to my publisher. Now, when I say “my publisher” I mean the micro-publishing company that published my first book, Postcards From Across the Pond. And yet, I don’t. There had recently been some acquisitions and mergers in the publishing house (the world of high finance; I’ll never get my head around it) but the new publisher was keen to do business with me. But then I published More Postcards From Across the Pond myself, just to see if I could do it. I could. Great fun. Now let’s get back to business. Postcards From Ireland was a hit with the new publisher and they we began to talk business. The problem was, because of my self-publishing lark, I now had one book on the inside and one on the outside and no way to join them up for a Tin Jubilee get together. No matter what I did, I would have two books in one place and one in the other. In the end, I decided to go the publishing route, and see if I could convince the publisher to take on the middle book as well. It sounded a good plan, but it didn’t work out; the new publisher and I failed to reach an agreement so I decided to publish Postcards From Ireland myself, which left one book with them and two with me. But then I received an e-mail out of the blue: the original publisher—the one who actually acquired my first book—decided to close down his part of the business, and the rights to my book, quite suddenly and unexpectedly, reverted to me. So I am now free to self-publish that one as well. This bodes well for my Jubilee celebration. I still don’t know exactly how I’m going to play it, but don’t worry, I’ll keep you updated. My Tin Jubilee is in full swing now, in fact, it is rapidly coming to a close. Ten years ago I was preparing to make myself homeless and jobless in order to fly 3,000 miles to another continent trusting the promise of a woman I had only known for six months that, once I got there, she would take me in. I arrived in the UK on 1 March (she did take me in) and 28 days later, I married her. So the 28th of March, in addition to marking the official culmination of my Tin Jubilee Celebrations, is also my 10th wedding anniversary which, among many other advantages and obligations (I think she might be expecting a card or something) means that, for the past decade, I have never had to worry about running out of milk. This is strange because my wife doesn’t even drink milk, yet she always knows how much we have at any given time and, more importantly, whether or not we need to buy any. We’ll often be out for a walk in the evening and my wife will say that we need to stop at the offie on the way home to pick up quart of milk. I did a Google search for "Milk photos" and this came up, it's not my fault. I find this amazing. If you see me wandering around the town center and run up to me to ask, “How much milk is in your fridge right now?” I will not have any idea. More telling, if you wanted to know when I was next having dinner at my in-laws, I wouldn’t be able to remember that, either. This isn’t to say that, while I was single, I was always running out of milk, but my life was more ordered then—I didn’t travel for work, I never went to my in-laws for dinner and I therefore tended to use a set amount each week. And if it started to smell a bit funny, I’d stop at the convenience store on the way home from work and pick up a quart. Those days are behind me, however; for the past decade, I have not had to think about milk—how much we have on hand or how much we might use during the upcoming week—at all. Admittedly, as marriage perks go, this is pretty far down on the list, but that doesn’t make it any less appreciated. In the manuscript for Postcards From Ireland, I talk a bit about cigars because, as the opening line points out, Ultimately, it was all because of the cigars. Without cigars, I would not have gone to Ireland, I would not have met the woman who would become my wife and I would not have moved to England. Writing that story was an exercise in nostalgia, but not simply due to reliving how I found love among the leprechauns, it was also due to recalling those days when I was involved in the cigar culture. 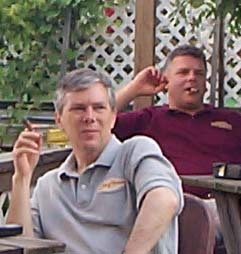 Cigars are still apart of my life but, back then, they were a huge part; this blog (or, to be exact, the web log it grew out of) was originally a chronicle of my cigar-related adventures. It was, believe it or not, a magical time. I don’t go into that era very deeply in the book, because I didn’t think it would be of great interest to the average person, but it was nothing short of astounding. My then girlfriend, who I now refer to as She-Who-Must-Not-Be-Named, used to dabble in cigars. She and her college buddies used to go to a cabin in the Adirondacks and spend the weekend smoking cigars around the fire, so we revived the tradition and found it very satisfying. 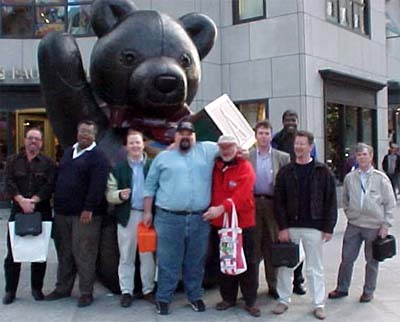 After a time, we discovered a few people at work who were also cigar smokers, and then we started haunting newsgroups (for you youngsters, that was the precursor of Facebook and Twitter) and invited some of the local members to meet up with us. We all got along like a house on fire (and judging by the smoke we produced, you would think the house really was on fire), so we began having regular meetings. Incredibly, this same thing was happening simultaneously in other cities throughout the US and even in other countries. Eventually, these individual groups began hosting cigar exchanges, where members of other cigar groups would come to the host city for a weekend of organized cigar-related events, including cigar dinners, visits to regional landmarks, raffles and tours of local cigar shops. It was an enchanting time, the sort of thing that happens so spontaneously and so perfectly that you know you are involved in something special. I don’t recall ever wishing it would go on forever, or worrying if it would end, we were just all caught up in the moment. Our cigar group called itself The Herftones—being a combination of the music group The Nowtones and “herf” which is the cigar-world term for smoking cigars. Our annual cigar event was called ASHCAN—Albany, Saratoga Herf Crawl and Nosh—and we even had a Long Island chapter where we went every summer for ASCHANOLI, or ASHCAN on Long Island. The other city’s cigar crawls had equally tortured acronyms, such as HITS, the Buffalo chapter’s Herf In The Snow, and SALT, Syracuse’s herf event that I can’t recall the translation of. At a Herf Event in Boston. Don't let the size of the group fool you; this is merely a fraction of the people who attended. Also, though this photo is 100% male, we had a surprising number of women in our ranks. The small suitcases many of us are carrying are called Herfdors, and they are filled with cigars. This went on for years. But the important thing (or the thing that is relevant to my new book) is that this activity was directly responsible for my going to Ireland (you’ll have to read the book to find out how), and going to Ireland was directly responsible for me moving to England. No cigars, no England, and no Postcards From Across the Pond. I left the US while the Herftones were still going strong, and in a way I am glad I did. Shortly after I left, the no smoking regulations came into force, which made organizing cigar crawls much more difficult. Eventually, they stopped, and then even the local get-togethers faded away. Now, those of my herfing buddies who still continue to smoke cigars, are pretty much like me—solitary herfers who continue to enjoy a solitary cigar (“Thought in the early morning, comfort in time of woes, peace in the hush of twilight, balm ere my eyelids close”—this is what a cigar provides, as Kipling points out in his epic ode to cigars, The Betrothed) but rarely, if ever, do we meet up with other cigar aficionados for a proper herf. But solitary as our herfing now is (what, I wonder, is the sound of one man herfing) we can, as we muse on the soft blue veil of the vapor, know that for one, brief, shining moment, we were Herftones. We even had shirts made; the oval logo on the left breast reads, "Herftones"
You’ve been waiting for it, and now it’s here! No, not the Queen’s Diamond Jubilee, or the official launch of the London Olympic Games hype, or the year of the Mayan Apocalypse—2012 is my Tin Jubilee Celebration, and I’m kicking it off today. Ten years is quite an age for a blog, and in that time, the blogging world has changed dramatically; well, first it was actually created, then it changed. In the early days, I maintained Postcards on a website using HTML; it wasn’t until after the publication of the first book that I moved—at my publisher’s insistence—to a blog, and that didn’t happen until November 2008. I suffered a brief and frightening flirtation with Wordpress during my early months, but scurried back to Blogger with my tail between my legs after only a few weeks. In June of this past year, however, I made a second attempt and managed to establish a beachhead, and eventually a full-blown blog empire, in Wordpress. 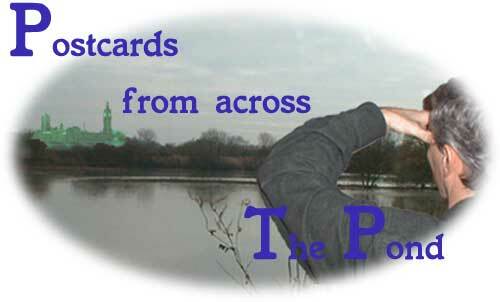 Since publishing the first book and abandoning HTML, I have published a second Postcards book, and have recently completed the manuscript for the third—Postcards From Ireland, the final book of the Postcards Trilogy. You’ll be hearing more about that in the coming weeks, but for now, I offer the very first post on the Postcards From Across the Pond web log (that’s what we called ‘em in those days, sonny). This is, without a doubt, the most drastic undertaking of my entire life. For all that, I think I have it fairly well under control. There are so many variables and so many things to co-ordinate, not the least of which is disentangling myself from my civil service job where I have been working for the past quarter century. After that much time, your life becomes so pervaded by the 'culture' of civil service you begin to take it all for granted. The money isn't great, but it has always been comfortable, and lately it has been very good. The job, for the most part, is at my convenience, thanks to liberal holiday, personal and sick leave. I have, for my entire adult life, had excellent health benefits, a good dental plan, eye care and a host of other perks. All of that is about to change in ways I cannot even imagine. I have never been unemployed before, and the thought is frightening. Not only will I have to find a new job, but I'll have to do it in a strange culture. There is also the unsettling thought that this is all irrevocable. Once I quit, once I move out of my apartment, once I get on that plane and head for the UK, there is no going back. Well, I could go back, I suppose, but I'd have no job, no place to live and no money. Does all this give me second thoughts? No. Pause for thought, yes, but not second thoughts. Despite the problems in selling my car, getting rid of all my stuff, trying to wade through the red tape of immigration and tax laws and the daunting thought of having little money in a culture where the cost of living is much higher than it is here, I have the deep conviction that I am doing the right thing. In my mind, I have only two choices; continue to live in America and finish out my life working at a cushy and undemanding job or accept the hardships inherent in such a move and build a life with a woman who is deeply in love with me and who I love dearly. When looked at that way, the choice is obvious. And so I spent the day sorting through my stuff and making multiple trips to the dumpster. I arranged to sell my furniture and worked out a plan to get rid of my car. I studied the tax laws and checked into my financial situation. All in all, things don't look all that bad. Not yet, at least. Right now, everything still seems surreal and England seems very far away. What I have to hang onto is the knowledge that, when I am there, I feel at home and happier than I can ever remember being. For now, that's going to have to get me through.